In the Good Old Days, which were apparently not that long ago, the protagonist of this debut novel was a New York City garbage man. But then another major terrorist attack made much of NYC a ghost town, and in the wake of the attack, virtually all of the major businesses and many of the people who once lived there fled for greener pastures. One of the victims of the attack was the protagonist's wife, and in the wake of the disaster, he has gone into a different branch of the disposal business and has become a hitman for hire. He does have his rules and standards, though, among them being that he won't kill children. Now known as Spademan, the killer is hired to target the runaway daughter of a powerful television evangelist. Fortunately, the girl has just turned eighteen, which makes her legal as far as Spademan is concerned. He tracks her down without a lot of difficulty, but then gets an unsettling surprise and the story races off on a different track. 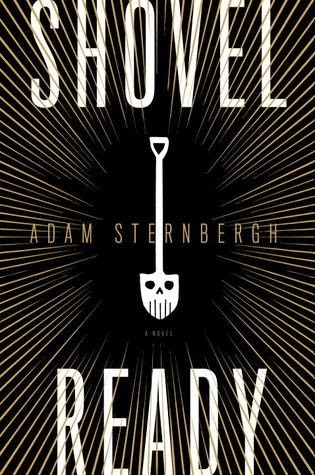 Sternbergh has created a dark, eerie vision of a dystopian NYC in which many of the wealthiest citizens who remain there have effectively chosen to opt out of life by spending long periods of time in virtual reality chambers, tended by nurses and others who take care of their remaining basic needs, feeding them through IV tubes and so forth. Meanwhile, the city continues to disintegrate around them while the rest of the country apparently goes about its business, physically unharmed but not nearly the same now that the city that was, to a great extent, the country's beating heart no longer exists. While I appreciate what Sternbergh has accomplished here, this book did not work for me as much as I had hoped. I can understand the emotions that Spademan must have experienced upon losing his wife and his city in the same moment, but I never understood why he chose to become a hired killer. I also had trouble buying into the premise that the rest of the country would turn its back on NYC and let it simply rot away. Especially in light of the way that the rest of the country rallied around NYC in the wake of the 9/11 attack, this didn't add up to me. That said, this is a book that will probably appeal to a lot of readers who are more tuned in than I to sci-fi stories with a heavy noir element. It's gotten a fair amount of critical acclaim and will probably find a large audience.